This case study goes back to 2007 when the mother of the victim was admitted to Darent Valley Hospital, ready for her baby to be delivered. After spending a night being monitored in hospital, tests done in the morning showed that the unborn baby was in some distress. Yet despite these test results, nothing was done to induce the pregnancy and speed up delivery. Over three hours later, the baby was finally born. Upon examination, it was found that the newborn baby was suffering from severe brain damage, caused by lack of oxygen whilst in the womb, specifically during the last few hours before the delivery. The full prognosis was that the baby was suffering from four-limbed cerebral palsy with epilepsy. The parents of the newborn contacted a cerebral palsy solicitor who then begun the process of claiming cerebral palsy compensation. The total payout in damages for this claim was £10.6 million. 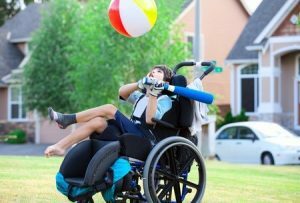 Here at Legal Expert, we can offer a similar service to parents who believe their child has suffered cerebral palsy due to some form of medical misconduct. This particular case was a greater payout than the average settlement for cerebral palsy. Although having said this, cerebral palsy medical negligence cases could pay even more if the circumstances surrounding the case were particularly dire. Cerebral palsy is a serious medical condition which can significantly lower the quality of life of the sufferer. The term is used to indicate an infant which has impaired muscle coordination in one or more limbs, as well as other disabilities caused by the same effect, damage to the brain during the birthing process or the pre-birth treatment of the mother. The parents of the newborn decided to pursue a cerebral palsy compensation claim against Darent Valley Hospital. Although it should be noted that the claim itself was made on behalf of the child, not the parents. Medical experts were called in to give an expert opinion, and these included a paediatrician, neuroradiologist and obstetrician. After an initial hearing, an interim payment of just £100,000 was paid. This is typical in such cerebral palsy cases, as cerebral palsy lawsuit verdicts can take some time to achieve, so the small initial payment helped the parents deal with the initial expenses of caring for a severely disabled baby. The full £10.6 million was not agreed upon until much later, more on that below. The opinion of the paediatrician was that it was impossible to determine the probable life expectancy of the infant until they were five years old. Because of this, the parents were awarded several more interim payments throughout the lifecycle of the claim, so that the young child could gain access to the therapy it needed, as well as the correct level of private medical care, which included two full-time carers, likely for the rest of its life. The initial interim payments were nowhere near the full claim. Cerebral palsy compensation payouts 2017 were typically much higher than this initial interim amount. The next part of the settlement was paid when the family had to relocate to a new home, one which could cater to the care needs of the infant. This amounted to £800,000. However, it came to pass that the new property still needed modification to make it ideal, so a further payment of £800,000 was made to cover this cost, and also to provide rental accommodation for the family whilst the work was completed. The claims process went on and on, which would be an incredibly expensive proposition if a no win no fee solicitors were not used. Cerebral palsy compensation claims can take a long time to resolve, as proving medical negligence is a complicated proposition. Finally, after six years, the claim was settled out of court. The infant was awarded a cash lump sum of £3,267,490, followed by yearly payments of £267,000 until the 18th birthday, and then £296,550 per year until death. As we can see from the case above, cerebral palsy claims can take a very long time to resolve. If you had to pay for the legal costs out of your own pocket, it would cost a large amount of cash. This is why we believe that the best way to proceed with a cerebral palsy claim is to engage a legal firm under a Conditional Fee Agreement. This means that there are no legal costs to pay until the case is complete. If you don’t win any compensation, then you don’t pay anything. If you do win compensation, the legal fees are taken directly out of the money awarded. We are a legal firm that has its own in-house cerebral palsy solicitors. If you believe that your child has been injured due to medical negligence in the run-up to, or during the birth, then you could be able to claim cerebral palsy compensation. If you would like to know more, then gives us a call on 0800 073 8804. We will take the details of your potential case, and if we think you have a good reason to claim compensation, we will likely offer to represent you legally under a no win no fee agreement. You won’t need to pay anything up front, and you don’t need to pay anything at all until we win some compensation on your behalf. You have nothing to lose, call Legal Expert today and find out how we can help you. This link takes you to NHS information on cerebral palsy including causes, symptoms and treatments.. This link to SCOPE is for families and cerebral palsy information. Legal Expert guide to claiming compensation for cerebral palsy.